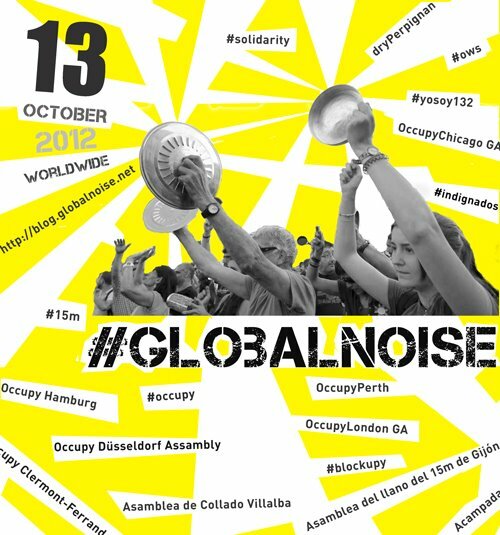 160+ Cities Joining #globalNOISE on #O13. Get Banging! To find a globalNOISE action happening near you visit this page. Or start your own globalNOISE! And keep connected with us. Visit this page for more information. If you want to get involved with the planning group please sign up here. Join us on our Mumble Meetings on Fridays at 3pm ET. Click here for more info. We plan to have a special version of the website to cover worldwide globalNOISE actions from 12.-20. Oct. Check out #London – they made a nice video for you to watch and share! Noise is a language--it is the language of idiots--the 1% who learnt nothing of value. So, I suppose the noise will make them laughing stock to the world.